In many ways, Travis Joyce, Kelcy Newton and Carter Smith are typical high school seniors, yet the three seem more self-assured, armed with a clearly mature vocabulary and without any uncertainty about what’s next for them. They are veterans of the Southwire Engineering Academy (SWEA), a partnership between the giant West Georgia wire manufacturer and Carrollton High School, a collaboration that leads students like Joyce, Newton and Smith out of the classroom and into scheduled work sessions in several of Southwire’s departments. This is hardly forced labor; the students clamor for a spot on the academy roster, with only the brightest – and perhaps luckiest – landing in one of the available slots. Students who work in the company’s engineering academy are selected from Carrollton High’s STEM program, the acronym standing for science, technology, engineering and math. This academic year, 24 high achievers were selected for the Southwire Academy, up from 20 in last year’s program. Students in the academy spend their last two high school class periods at Southwire every other day, according to Godfrey. At the end of the year, the SWEA students present the projects they completed to company executives and proud parents, as well as friends. It is a culmination of a year of work and learning, and the last lesson is displaying the confidence they’ve acquired in speaking to groups. “You can see that confidence and pride shine through,” Godfrey says. The academy students sign confidentiality agreements to protect what goes on behind closed doors at Southwire. Edwards and the Southwire executives began “fleshing out” their ideas, and within 90 days the partnership was formed and the pilot program begun. Southwire’s vice president for energy manufacturing, Tom Heberling, installed the framework for the Engineering Academy. He has two employees who help guide the students and report back to him on their progress. Heberling says seeing the students make such contributions to the efficiency of the production lines gave him a “proud papa” moment. Though the Southwire Engineering Academy was never designed to be a recruiting station for the company, Heberling says the company is keeping an eye on the progress of the academy graduates as they move on to colleges and universities, which almost all of them seem to be considering. All SWEA students in the program are surrounded by engineers who act as sounding boards and mentors. 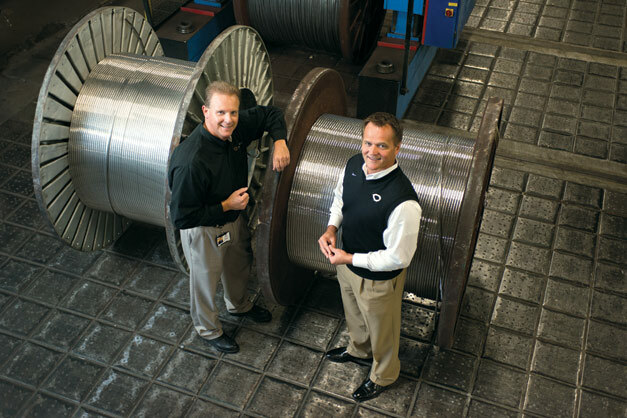 Other Southwire executives and employees were ready to help when the problem-solving teams faced a watershed moment last year as a Southwire customer unloaded a tricky dilemma before the group: How can the amount of wire left on one of those giant utility company reels be measured more efficiently out in the field? In the past, the measurement was taken by weighing the reel and its rolled wire. Knowing the weight and length of wire on the full reel, workers could make calculations by knowing the weight of a partial reel. But a truck attempting to lay wire at a site 50 miles from the utility’s storage yard scale could kill a day in the process of the round trip to find out what’s left on the reel. Solving that problem is the kind of intellectual thrill the students savor. Joyce says he is in the process of applying to Georgia Tech, Auburn, Clemson and Mercer. “It was really neat to work alongside the engineers at Southwire and really experience what it’s like to be an engineer,” he says. Daniel Jackson has had an intense interest in the progress of the first two years of the Southwire Engineering Academy and now serves on the STEM board of directors, with that organization providing the wellspring for SWEA student candidates. For Jackson, president and CEO of Carroll Tomorrow and the Carroll County Chamber of Commerce, the Southwire collaboration has linked the student experience to a tangible bottom line in economic development. Some estimates in data offered by Southwire credit the academy students with assisting in producing savings or bottom line improvements of $700,000, a healthy figure under any conditions.